Swift Glass is committed to fully assessing the specifications of your next optical project and delivering quality, cutting edge results. Optical applications can be complex and demanding. That’s why we offer full service precision optical component fabrication services for short lead, high volume projects. Swift Glass also holds a vast inventory of optical materials for multiple applications, as well as a machining center for creating close dimensions. We offer scratch-dig specifications to 20-10 for demanding imaging and laser systems, and 1/4″ diameters to 36″ squares. Swift can manufacture custom optical wedges and optics for use in a variety of applications, with additional capabilities such as polishing and double-sided lapping. We take pride in offering materials from industry-recognized companies. Below is just some of the many materials that we source. Visit our materials page for a complete list. Is Your Glass Material Suitable for Your Application? 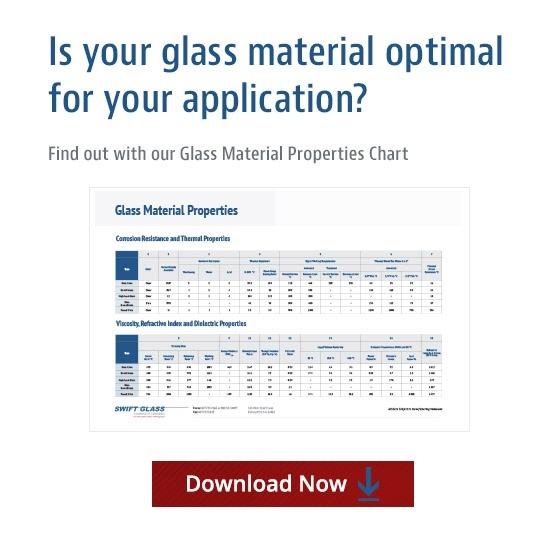 Find out with our Glass Material Properties chart. Understanding your glass material’s thermal, chemical and physical properties is critical to ensure it can withstand the application’s use and environment. At Swift Glass, our optical components are held to the highest industry standard. We utilize the best equipment to ensure that your products are delivered with top-notch results. If you have questions about how to bring your next optical application to life, please contact a glass expert today.